The Arthroscopy Association of North America (AANA) and VirtaMed have signed a two-year collaboration agreement making VirtaMed the preferred and exclusive partner for virtual reality simulation training. AANA and VirtaMed will work together to advance and improve the training of arthroscopic surgery skills and standards for proficiency-based training curricula by leveraging the latest virtual reality simulation technology and AANA’s expertise in Arthroscopic Surgery education. 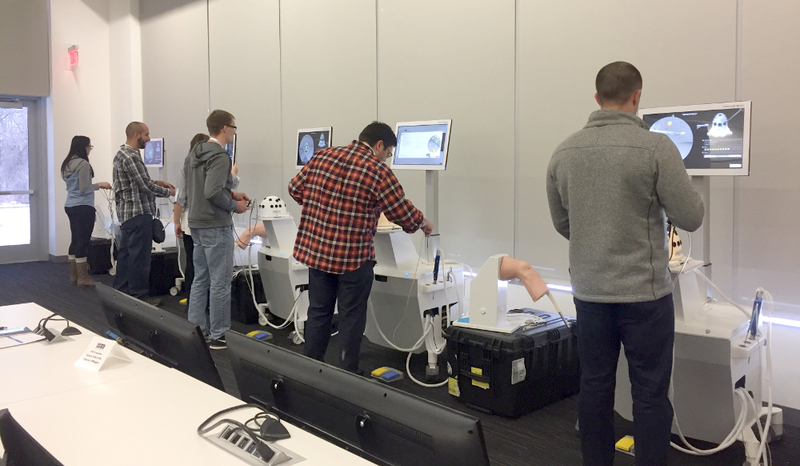 The most immediate result of the contract, signed in January 2018, is that the Orthopedic Learning Center (OLC) in Rosemont, IL, will be equipped with VirtaMed ArthroS™ simulators for knee, shoulder and hip arthroscopy training, as well as FAST basic skills training. “We are excited about the opportunity to add high-fidelity simulation into our selection of educational tools. VirtaMed’s top-notch virtual reality simulators are a perfect match to the new OLC with upgraded facilities and state-of-the-art technologies,” says AANA President Robert E. Hunter, M.D. AANA and VirtaMed will create new content for the simulator in all its disciplines, as well as a learning curriculum that fully leverages competency-based simulation training and assessment. The two organizations will begin with creating curriculums and proficiency exams shortly after they have collected data from course participants as well as faculty and the more experienced members of AANA early this year. VirtaMed simulators enable proficiency-based learning as well as skills assessment. VirtaMed and AANA want to use these tools to create standards and best practices for arthroscopic training and assessment across the United States. “Our goal is to improve patient care by advancing education in arthroscopy, and we want to ensure all arthroscopic surgeons have access to high-quality skills training and continuous education. Working with VirtaMed’s first-rate simulators, experienced developers and dedicated education specialists will help us reach that goal,” explains AANA Learning Center Committee Chair, Joseph C. Tauro, M.D. The Arthroscopy Association of North America (AANA) is an international professional society of more than 4,000 orthopaedic surgeons and other medical professionals who are committed to advancing the art and science of arthroscopy and minimally invasive surgery through education, skills assessment and advocacy. Our vision is be a global leader in arthroscopy and advancing minimally invasive surgical education, advocacy and skills assessment to improve patient care. VirtaMed is the world leader in high-fidelity virtual reality simulators for instructional training of minimally invasive diagnostic and therapeutic interventions in orthopedics, urology and women’s health. VirtaMed also creates customized simulators for medical associations and medical device companies using original instruments and anatomic models for realistic feedback. Would you like to learn more about how VirtaMed ArthroS™ is being used in the United States?